Today, when it comes to replacing missing teeth by having dentures, the most advanced option would be to have implant-supported dentures. In this procedure, the dentures are held in place using dental implants which are inserted into your jaw. Having implant dentures can present a number of advantages when compare to other denture options available today. Then again, before you can actually have this modern denture solution, there are certain factors that will have to be considered first. 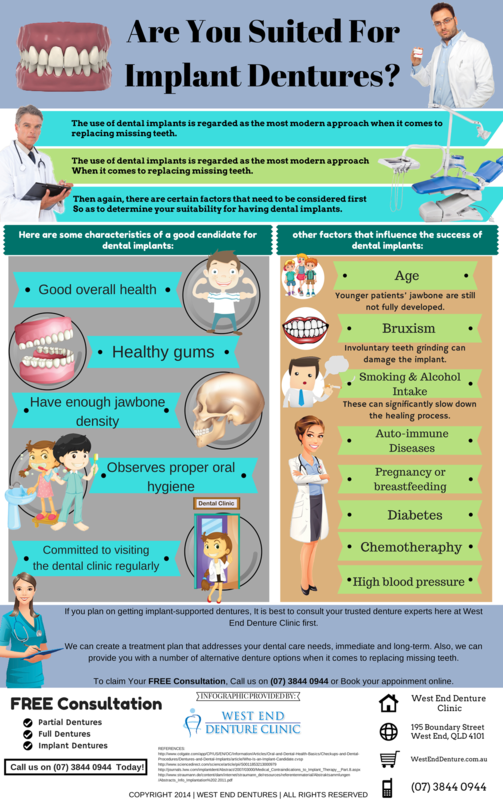 That is why it is extremely important to have an initial consultation with your expert dental prosthetist here at West End Denture Clinic in Brisbane. We will evaluate the condition of your teeth and jaw as well as your commitment to oral wellness so as to determine if you are indeed a good candidate for having implant dentures. For exceptional work on implant dentures and other denture options, consult us here at West End Denture Clinic. Your trusted dental prosthetist in West End Brisbane is well-equipped with the most advanced tools and techniques used in fabricating dentures that can fully restore the function of your teeth and the beauty of your smile. 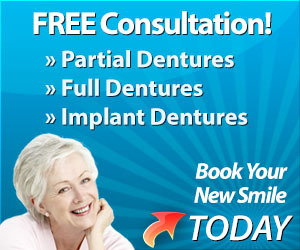 Call us today on (07) 3844 0944 or book an appointment online to claim your FREE denture consultation.